Here, We are. 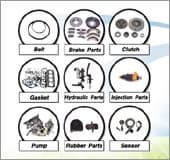 The most reliabile parts supplier of qualified parts & components for korean made vehicles and foreign vehicles. If you spare 5 minutes to stare our homepage, You have full information on wide range & assortment of our activities. We hope you will take advantage of our engineering ability to develop new items of your requirement. We establish specification & standard that are followed precisely by qualified manufacturers, subject to stringent inspection. With knowledge of our engineering control & accumulated experiences, We can offer you. The competitive pricing you need and rapid action for the successful business.